A felucca is a wooden sailing boat that is not only small and lightweight, but also extremely maneuverable. These characteristics make this style of boat perfect for rivers and protected waters. They are commonly found plying the waters of the Mediterranean and the Nile in Egypt. A felucca can be easily identified by its large triangular sails, which are called lateen sails. A felucca can be rigged with two or three lateen sails. By the 18th century the popularity of this versatile craft spread to Italy and along the French Riviera. Here they were often used as passenger craft and for transporting items such as mail. By this point it was not uncommon to see feluccas fitted with up to twelve oars and a canopy at the stern to protect its passengers from the weather. There is a rather quaint mention of the use of a felucca in a mid 18th century travel book. Towards the end of the 18th century the popularity of feluccas had travelled even farther afield, all the way to the west coast of USA. To San Francisco to be exact. In 1884 a whole fleet of feluccas was put to work in the bay as fishing trawlers. 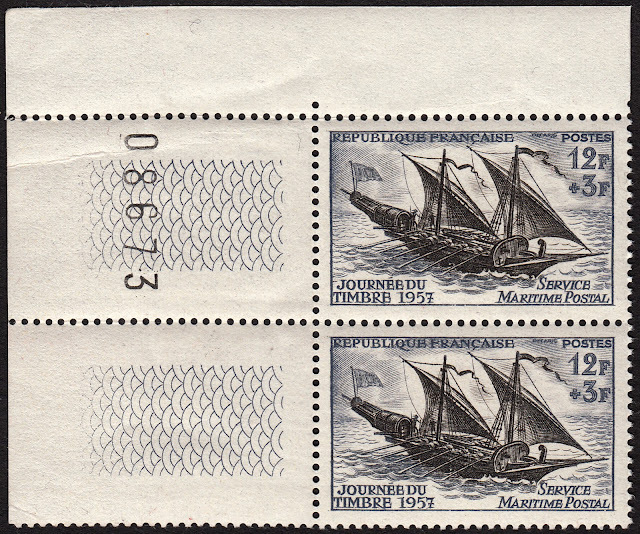 Over the years France has issued some stunning stamps to celebrate Stamp Day. The stamp chosen for Stamp Day 1957 was no exception. In fact, it is one of my personal Stamp Day favourites. 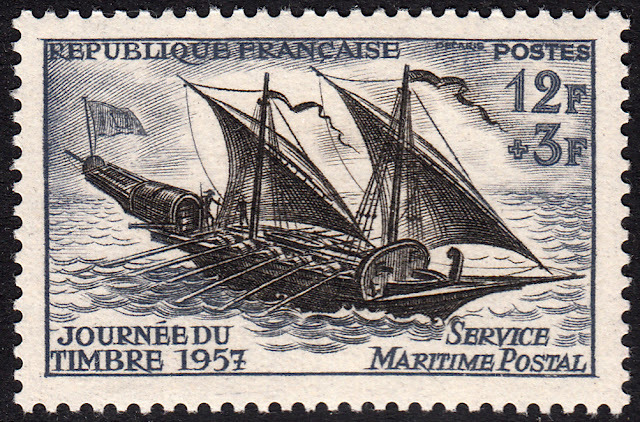 The stamp in question was designed and engraved by Albert Decaris, and it was issued on 18 March 1957. Like other Stamp Day issues it was a semi-postal with a value of 12f + 3f. The 3f surcharge went to the French Red Cross. I also have a copy of this lovely stamp in a border pair, which is sublime.